Aston Villa struck twice in the last 20 minutes to seal a deserved win and dent Arsenal's Premier League title hopes. Gael Clichy headed Ashley Young's cross into his own net after 70 minutes and Gabriel Agbonlahor raced clear to add a second 10 minutes later. Young had seen a penalty saved by Manuel Almunia in the first half as Villa produced an outstanding display. Brad Friedel saved well from Cesc Fabregas in the first half and Emmanuel Adebayor hit a post late on. For Villa, the win will strengthen their belief that they can challenge for a top four place this season, but the result will be massively frustrating for Arsenal boss Arsene Wenger. After watching his side respond to criticism by beating Manchester United at the Emirates last Saturday, Wenger watched his side undo all that good work against a Villa side who played with huge self-belief and attacking intent. Villa's positive approach was underscored in the opening seconds when Young raced forward and fired in a powerful drive that tested Almunia. It set the tone for an enthralling first 45 minutes, with Villa the dominant force for long periods, troubling Arsenal with their pace in attack. But Arsenal almost broke the deadlock after 15 minutes when Friedel saved from Fabregas and Curtis Davies needed to make a desperate clearance as the ball ran loose. Villa squandered an opportunity to take the lead five minutes later when referee Mike Riley rightly pointed to the spot as Theo Walcott hauled down Young after a goalmouth scramble. Gareth Barry, who has taken penalties so expertly for Villa in the past, was injured in a tackle with Fabregas in the build-up, so Young stepped up and saw his weak spot-kick saved by Almunia. Young was causing real problems for Arsenal's rearguard, and he twice posed a threat with a shot that Almunia saved and another effort that was off target. Villa deserved huge credit for taking the game to Arsenal, but they were wasteful when presented with opportunities and missed another nine minutes before the interval. Agbonlahor escaped down Arsenal's right flank and pulled the ball back invitingly for Barry, but his shot was again kept out by Almunia. 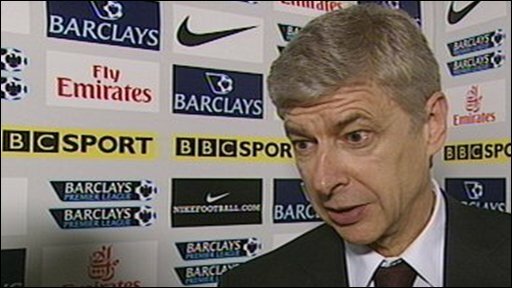 The game continued in an open fashion after the break, and Wenger decided he needed extra cutting edge by introducing Adebayor in place of Abou Diaby. But Villa had a clear game plan - it was to use the pace of Young and Agbonlahor at every opportunity and they continued to threaten on the counter-attack. They were central figures as Villa got the goal their enterprise deserved with 20 minutes remaining. Bacary Sagna was down injured as Villa attacked down the right, and when Young whipped in a dangerous cross Agbonlahor pressurised Clichy into heading past Almunia. Arsenal were stung into a response, and a minute later Adebayor's header bounced on to the post and away to safety. Villa's threat on the break was even greater as Arsenal pushed in desperation for an equaliser, and it resulted in them doubling their advantage after 80 minutes. Agbonlahor latched on to a long clearance from Martin Laursen as Arsenal waited in vain for a free-kick to be given and he shook off the flimsy attentions of William Gallas to beat Almunia with a low shot from the edge of the area. "It was a very bad afternoon because we were not sharp physically and beaten everywhere in the first half. 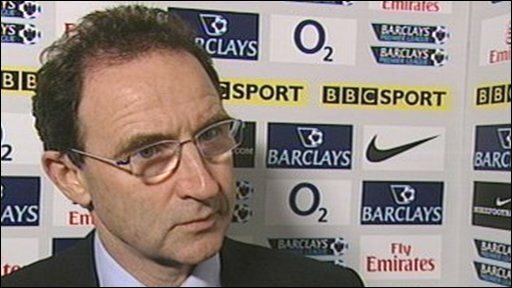 "I felt overall Villa were the better side. It is frustrating because we played at a kind of pace today that is not our pace. Villa played very well, but we were not sharp or incisive enough. "We can play very well, but at the top level performances have to be consistent. I always say the first sign of quality is consistency, so this was frustrating after beating Manchester United." "We were terrific from start to finish. We came here on the back of two poor league results against Newcastle and Middlesbrough to face a massive test - and we passed it with flying colours. "We were magnificent and the players were very strong mentally today. I thought we were brilliant because it was a case of the players staying strong, being positive and having a real belief that we could win. "We never lost belief, never lost confidence and I am absolutely delighted." Arsenal: Almunia, Sagna (Toure 71), Gallas, Silvestre, Clichy, Walcott, Fabregas, Denilson, Nasri, Diaby (Adebayor 61), Bendtner (Vela 68). Subs Not Used: Fabianski, Ramsey, Song Billong, Djourou. 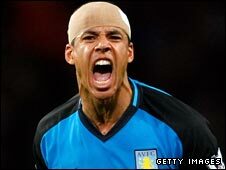 Aston Villa: Friedel, Cuellar, Laursen, Davies, Luke Young, Ashley Young, Sidwell, Petrov, Barry, Milner, Agbonlahor. Subs Not Used: Guzan, Harewood, Carew, Knight, Salifou, Reo-Coker, Gardner. Booked: Friedel, Barry, Agbonlahor, Sidwell. Goals: Clichy 70 og, Agbonlahor 80. BBC Sport Player Rater man of the match: Aston Villa's Ashley Young 7.87 (on 90 minutes).